Truth Troubadour Blog: On Taking an Oath to Become a 2012 Electoral College Presidential Elector for Rocky Anderson: It's Time to Vote for Justice! On Taking an Oath to Become a 2012 Electoral College Presidential Elector for Rocky Anderson: It's Time to Vote for Justice! Last summer songwriter Vic Sadot met Rocky Anderson, 2012 US Presidential candidate for the Justice Party USA, at a small dinner gathering at the home of Cynthia Papermaster of Code Pink Golden Gate Chapter in Berkeley, CA. Rocky is the former mayor of Salt Lake City with extensive management experience, a great record on human rights, and a reputation for getting people to work together. During a road trip to Santa Cruz, Vic started writing this song. He sang the first version there at a restaurant gathering for Rocky, who had earlier spoken at Occupy Santa Cruz on the steps of the US Post Office. Rocky is about principles rather than special corporate interests. He will stand for Constitutional Rights and against lies for war profits as he has done for years. He has been quite outspoken about Torture Accountability as well. Vic has been a member of the Green Party USA since 1999. Vic and his brother Rob Sadot performed some songs for Ralph Nader in the 2000 Presidential campaign at the Unitarian Universalist Fellowship Hall of Newark, DE. Vic was especially enthusiastic about Cynthia McKinney as the 2008 Green Party USA Presidential contender because of her consistent and courageous stands for truth, justice, and peace. Vic and Rob Sadot met Cynthia McKinney at a gathering in Delaware in 2008 during her brief stopover on a long road trip from Maine to New Orleans, Louisiana to serve on a people's commission to investigate the government's criminally negligent response to Hurricane Katrina in 2005. Vic handed her a CD for the long road trip. Later, she wrote an enthusiastic endorsement of the songs of Vic Sadot. Vic has sung for a number of Green Party, California events. Lately, Vic has been doing some work to promote Dr. Jill Stein, the current Green Party USA Presidential candidate. Vic also supports 2012 Libertarian Party Presidential candidate Gary Johnson's Anti-Trust law suit against the US Presidential Debates Commission for excluding all but the two show candidates from the debates, thereby claiming the right to monopolize US elections as well as the economy. California requires 55 Electors for a Presidential candidate. Vic Sadot signed up to be one for Rocky Anderson at the Registrar of Voters office in Oakland, CA on Sept 25, 2012. When it came time to swear "to honor & defend the Constitution of the United States and the Constitution of the State of California against all enemies, foreign and domestic", Vic Sadot said, "Well now, that's a formidable calling these days, is it not? What with the Congress passing Unconstitutional laws like the Patriot Repression Act and with current President Barrack Obama claiming the right to indefinitely detain or target US citizens and other "suspects" for killing without due process or habeas corpus, without the right to be innocent until proven guilty and to stand before your accuser! Just how serious do you want us to be about this notion of defending the US Constitution against all enemies foreign and domestic? ", asked the newly notarized Electoral College Presidential Elector Vic Sadot. The clerk was clearly baffled by this question about what was the meaning and the expectation of this solemn oath to defend the rights of the Republic. Fellow Rocky Elector signatory and concerned oath-taker Mark Schwartz posed a question of his own to the attentive clerk, "You're not asking us to arrest President Obama, or Bush & Cheney, or any other war criminals are you?" The clerk assured him that no such thing was being required or requested by swearing to uphold the Constitution. He handed us our official copies as newly sworn in Presidential Electors for Rocky Anderson, and we went home safely after having a nice lunch and conversation at The Revolution Cafe in Oakland. *See also Vic's "Oh What A Day! (2012 Election Update) which mentions Bush & Cheney, Obama & Biden, and Romney & Ryan in the jubilant choruses. Eric Golub is featured on violin on that song. Link to Sound Cloud Free MP3 "It's Time To Vote For Justice"
Now we've been waitin' way too long to deal with what is really wrong! They promise this! And they promise that! The Republican and the Democrat! They break the law with impunity! Violate the Constitution! They think they have immunity! Cause they serve the Corporations! Now there's a way to vote for Justice! 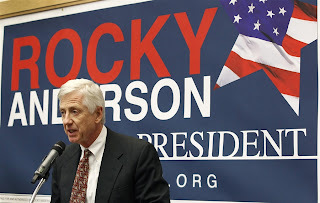 The party of Rocky Anderson! Yes, there's a way to vote for Justice! Together we can get it done! Cause it's time to put it into practice! It's time to stand and vote for Justice! Genuine Justice! How we thirst for Justice! Sweet waters of Justice! To serve us and guide us to Truth, Peace, & Justice! But those who bail the “banksters” out are too corrupt to serve us! And those who torture must be stopped! They must be brought to Justice! They lie for war like sociopaths cause money's all that matters! They want “our troops” to serve their wrath with a violence that shatters! Everything you do is under scrutiny, surveillance and repression! Everything they do is under secrecy! So they plunder with aggression!